Ask a question about your tour now! From the wonderful jungle entwined temples of Angkor to the verdant palm fringed beaches on the Gulf of Thailand, and from the majestic Mekong River to the diverse rural communities dotted around the country, Cambodia’s location at the cultural interface between India and China has made it an intriguing destination for travellers throughout the ages. Like many ancient civilisations described in the Qur’an, Cambodia experienced various dynasties reaching its zenith under the Khmer, who built Angkor Wat, one of the world’s largest religious buildings. This was followed by periods of civil strife and colonisation, then independence, and finally the modern republic which went through a particularly brutal episode under the Khmer Rouge in the 1970s. The Cham are one of Southeast Asia’s notable ethnic groups, and form the core of the Muslim communities in both Cambodia and Vietnam. 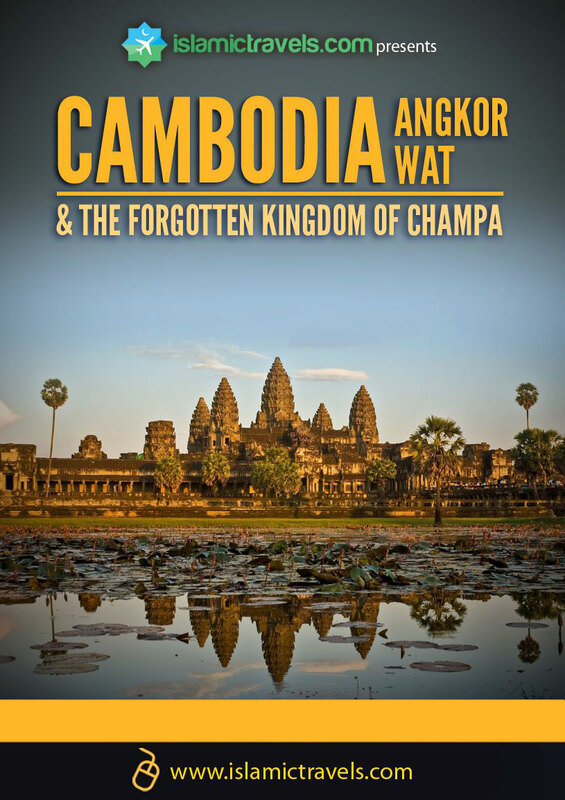 The Kingdom of Champa, founded in the second century CE was one of the most powerful empires in Indochina, covering much of what is today Vietnam and parts of Cambodia. The 13th century Muslim geographer, Shams al-Din al-Dimashqi, mentions that Islam arrived in the region during time of Caliph Uthman (ra) and some of the Cham Muslims trace their ancestry to Jahsh, the father of Zaynab bint Jahsh (ra), one of the wives of Prophet Muhammad (saw). A number of Sahabah and their successors who travelled from Arabia and Abyssinia towards China stopped along the coastal route, heralding a period in which Islam began to spread in the region and helping to strengthen the Spice Route linking the Arabian Peninsula to Southern China and the Malay Archipelago. By 1676, the Kingdom of Champa, which was originally Hindu, became majority Muslim. When the kingdom eventually broke up, the Cham people were scattered across South East Asia. The Khmer Rouge years were especially difficult for the Muslim community as they were often singled out and killed with many mosques destroyed. Today, it is estimated that there are up to one million Muslims in Cambodia who are spread throughout the country. Their presence is particularly significant in the provinces of Kompong Cham, Battambamg, Kompong Som, Kompong Chhnang and Phnom Penh. Many are poor and are illiterate but Islam has always been in their hearts and is being revived, alhamdulillah. A longer trip combining Cambodia with neighbouring Vietnam is possible for those who are interested in experiencing both countries. 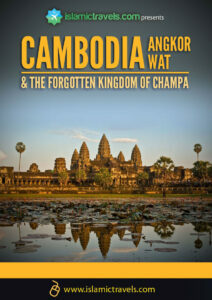 Join us, as we rediscover the “Forgotten Kingdom of Champa”. The package comes without flights and visa (purchased on arrival) but includes all local transport, breakfast, 3 or 4 star accommodation with en-suite bathroom, English speaking guide, and entrance fees to sites of interest. Lunch and dinner are not included but can be arranged by our guide. The food provided is halal, wholesome and indigenous to the region, thus giving an authentic feel to the culinary experience. The exact itinerary is subject to minor modifications depending on the size and composition of the group, as well as local circumstances at the time of the trip. Each day there will be a short briefing, important historical events and landmarks will be highlighted by our guide, while there will be spiritual reminders given from time to time. Angkor Wat Temple Complex, Floating Village on Tonlé Sap Lake, Nurul Ihsan Mosque, Unspoilt Beaches on the Gulf of Thailand, Muslim Villages in Baray and Kompong Som, Tuol Sleng Genocide Museum, Kbal Chhay Waterfall, and more. Siem Reap, Kompong Thom, Sihanoukville and Phnom Penh. Since international flights to and from Cambodia are not included in the package you are advised to book flights according to the dates advertised. The exact arrival and departure dates, along with preferred flight times will be discussed at the time of booking. Upon arrival in Cambodia our local operatives will receive guests and look after all transportation requirements within the country until they are dropped off again at the departure airport. Good quality 3 or 4 star hotels in convenient locations will allow you to easily reach the most important attractions. Participants will normally spend 1-2 nights in each city or town. Breakfast is provided. In the standard package there will be 2 beds in each room (twin rooms) or 1 double bed for couples. There may also be the option of 3 beds (triple room) for larger families subject to availability. Other features include en-suite bathroom with shower and toilet, air conditioning, wi-fi internet connection (free or paid) and satellite TV.